Fujitsu Toshiba Mobile Communications has unveiled the first smartphone that will ship natively with Microsoft’s upcoming “Mango” build of Windows Phone which was just release to manufacturers a few days ago, also known officially as Windows Phone 7.5. At events in Tokyo at the KDDI Designing Studio and at the Aichi Prefecture in Nagoya, Japan, the cryptically-named IS12T smartphone was shown off to analysts and the public. The IS12T features a 3.7” multi-touch screen, 13.2 megapixel camera, integrated Bluetooth and Wi-Fi, and 32GB of storage. 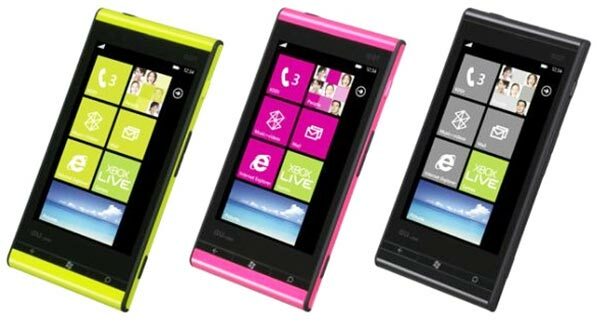 The phone will be available in three colors when it ships in Japan sometime around September—pink, yellow, and black. Perhaps most interesting, the IS12T is also water and dust-proof. Other details, like the phone’s processors, RAM, and price weren’t available. Microsoft had hoped that Windows Phone would allow the company to more favorably compete with main rivals Google and Apple in the smartphone OS race, but a year after its initial release Microsoft has actually lost market share according to IDC. At about the 0:49 mark of the video above, Microsoft CEO Steve Ballmer excitedly shouts, “We've gone from very small to--very small, but it’s been a heck of a year!” Continuing on he then says, “And you’re going to see a lot of progress in that market competitively, as we move forward.” Ballmer’s optimism is most likely rooted in the agreement Microsoft and Nokia have entered and the upcoming wave of other Mango-based devices due to ship in the coming months. Despite many positive reviews though, if the initial reception of Windows Mobile is any indicator, Microsoft is in for one heck of an uphill battle. According to Microsoft Windows Phone 7.5 will add approximately 500 improvements to the Windows Phone OS including Internet Explorer 9, an e-mail “conversation view", and a chat-threading feature that integrates text, IM, and Facebook chat messages from single contacts into a single thread. Many of the other improvements to the platform are more obscure, but Paul Thurott at the WinSuperSite does a great job explaining many of them in multiple articles on the site. Whether or not Mango helps Microsoft gain market share in the smartphone space remains to be seen, but the new version of the OS does sport many obvious improvements and addresses a number of initial concerns. The number of applications available in the Windows Phone Market has also continued to grow. The last remaining piece to the puzzle is hardware—if Microsoft and its partners release some exciting and competitively priced devices in time for the holidays, the smartphone market could be in for some fireworks. We’ll all know soon enough.